After you have made several of your own pizzas and you experience the variety and quality that can be achieved in-house, carry out or delivery become less appealing. From time to time, certain pies are an adequate substitution for homemade, but last week I wanted to venture outside the realm of familiarity and try something unique. I have become more and more fascinated by French cooking lately (and this is not merely because of "Julie and Julia" which I have not seen) and the other night a Pissaladière struck my fancy. On a side note, the last pizza stone Dawn and I had lasted several pizzas before it ended in shards after I forgot to place the stone in the oven while it was preheating. This was an instant learning moment and one of those cooking experiences that leave you wiser for the future. Ever since then, the new stone has performed well on the prior pizzas and this one as well. 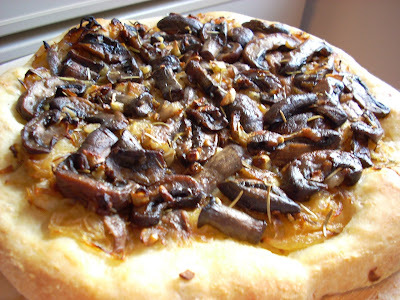 This Southern French "pizza" as you could call it consists of a caramelized onion base instead of the traditional tomato base often used in Italy. Pissaladière's are loaded with bursting flavors due to the length of time the mound of onions are allowed to cook in the oven with the bits of thyme and rosemary hiding inside to infuse flavor. Resting on top of the herb infused onions are the anchovies. I realize that anchovies are greeted with hostility and sneers by many Americans because of their pungent odor and salty nature, mostly due to the brine they are packed in. Whether you are on the reluctant team or the robust flavors side, the combination of onions, herbs, mushrooms, and anchovies in this dish is incredible. I chose not to rinse my anchovies prior to placing them on the Pissaladière, but it is a judgment call based on your taste buds. One way or another, these morsels of fishy goodness will leave you wondering why you never forgo tomato sauce for caramelized onions at least when you have a can of anchovies in the cabinet. That, or why you never venture farther than the comfort of Caesar dressing. Enough for approximately three to four crusts. Stir together salt and 3 cups flour in a large bowl. Add yeast mixture and remaining 1 1/2 cups warm water and stir until smooth, then stir in 1 cup more flour. If dough sticks to your fingers, stir in just enough corn meal, a little at a time, to make dough just come away from side of bowl. This dough may be wetter than other pizza doughs you have made. Knead dough on a lightly corn-mealed surface, lightly remealing work surface and hands when dough becomes too sticky, until dough is smooth, soft, and elastic, about 10 minutes. Divide dough in half and form into the desired size balls, then generously dust balls all over with corn meal and place in medium bowls. Cover bowls with plastic wrap and let dough rise in a draft-free place at warm room temperature until doubled, 1 to 1 1/4 hours. Before rolling out, balls of dough can be generously dusted with corn meal for added crunchy texture if desired. Please, if you have problems with cholesterol, high blood pressure, please, pretty, pretty please, don’t read this post. I don’t want to be held responsible. I finally finished up this quarter with the aid of too much caffeine, significant sleep deprivation, and of course the help of my wonderful husband. So, as I gleefully handed in my two final papers, I contemplated what to make for Daniel to tell him thank you for the week full of delicious brain food he prepared while I typed away and mumbled incoherently to myself. Immediately I thought of a recipe I cam across during a break. 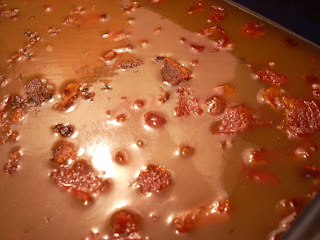 While I was working on papers, I would continually daydream about a recipe recently posted by Not Without Salt for Bacon Caramel. I was hoping that I was worrying for nothing and that it eventually would set, even if it took a little while. Surely it would set. It had to. My mother is an incredible candy maker, surely, it would set. I waited three or four hours, nothing. Stuck it in the fridge, still a gooey, sinfully delicious, but a sticky mess nonetheless. I decided to add wax paper and leave it in the freezer overnight. In the morning, it was slightly more solid when you initially took a piece, but quickly melted into a sticky lump. I’m not a good sport often times when things to work out correctly, so I contemplated throwing it away. It was obviously not going to turn into the delicate square, photo worthy and distributable caramels I was hoping for, and the only way to eat them would be with a spoon. A spoon...Sadly, when I think spoon, my mind immediately jumps to ice cream. I don’t know why, and yes, its probably unhealthy. 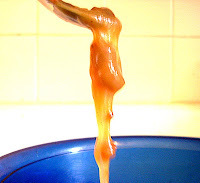 Nonetheless, the more I started thinking about, the more I thought the texture would work very well as a caramel swirl in ice cream, since it would not become incredibly hard, nor would it melt into the stick mess when trying to eat it. 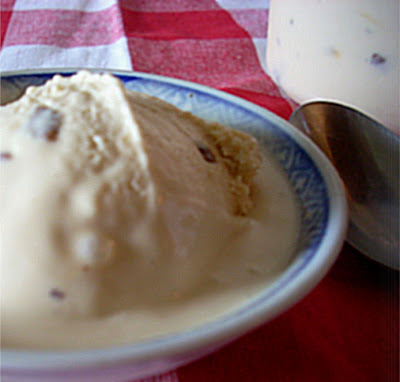 I quickly tried to put together a recipe for an ice cream that I thought would complement the sweet salty flavor of the caramel. Although I can envision these working beautifully and decadently with a dark chocolate ice cream, I wanted something that would allow the flavor of the caramels to shine through a little more. I immediately thought of a sour cream based ice cream, but shockingly, we don’t buy sour cream. Ever. We just don’t use it. When I make a cheesecake, I get a small container, and any that’s left typically goes to waste. What we did have was a nice Greek style yogurt that I’d been snacking with during finals. I didn’t want anything too sweet, the caramel is plenty sweet on its own, but I did want to taste more than plain yogurt. What I finally decided on was a brown sugar custard with approximately half the amount of sugar, and the addition of the Greek yogurt. The combination worked out perfectly. The ice cream had a velvety texture that quietly enveloped the indulgent caramel and added a nice palate-cleansing tang at the finish. The only problem with the final product however, is that the balance achieved between the sweet, salty, and tangy flavors prevents any one or two or three….or however many… bites from seemingly like enough! Thus the caution above. Consider yourself forewarned. Enjoy! First, whisk the egg yolks in a medium sized bowl. Heat whipping cream, sugars, and vanilla in a saucepan over medium heat, just until a gentle boil, stirring to prevent scalding. Slowly pour cream and sugar mixture into egg yolks, whisking constantly to prevent eggs from cooking. Return mixture to stove and cook over low heat until custard thickens. Pour into bowl and whisk in yogurt. Refrigerate until cold. 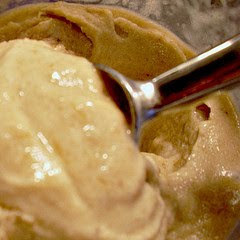 Once the mixture is chilled, add to your ice cream freezer. If your ice cream freezer has a spot to allow for mix ins, when ice cream is taking shape and there are approximately 5 minutes or so left, start slowly adding in the bacon caramel at room temperature. If not, once ice cream freezer has finished, transfer ice cream to container and pour caramel in slowly, folding to obtain a swirl effect. Freeze until ready. Weeknights are always intriguing times for me to cook, since it is last minute, and I enjoy launching into a simple yet appealing meal. When I got home from work the other night, I began digging through the cabinet trying to figure out what would go with the flank steak I had laid out. The weather was nasty outside so it had to be an inside dish. Something that went with the garlic chili paste that I just bought a couple days earlier. Chili paste reminds me of when Dawn and I began cooking together in her apartment in Pensacola, when we lived in Florida. When we started making sushi, we ventured out to the international market, of which the name escapes me at the moment, to buy some chili paste. We ended up returning with chili paste, barbecued eel for sushi, smoked trout, smoked salmon, as well as a variety of other ingredients that the Egyptian man would always suggest when we rang out. It was a mix between haggling and informative conversation every time you saw him. "You should try this new Bulgarian wine we are carrying, or a French cheese," or in the case of that night smoked trout (which happened to make excellent sushi). Back to the flank steak, garlic chili paste, and nice plump spaghetti squash that had been sitting on the counter a couple days. 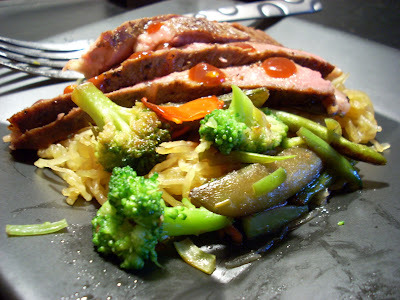 I settled on using the spaghetti squash as imitation rice noodles, the flank steak to be grilled on the grill pan, and the garlic chili paste as a sauce for the steak. An imitation meal from the steak to the squash, but it is all in the finished product. Cast iron is an incredible if not trying tool to work with and one that works impeccably well as a grill pan. Cooking on a well seasoned cast iron skillet or grill pan produces the most mouth watering sear but the most difficult cleaning task sometimes. I heated it to screaming hot with a couple teaspoons of olive oil for lubrication. I seasoned the steak by drizzling a few drops of olive oil on top and rubbed salt, pepper, and smoked paprika onto it. After about three to five minutes per side the steak should be medium rare depending on thickness. Make sure you allow steak to fall to room temperature before slicing to allow the juices to remain in the meat. The sauce which includes garlic chili paste, soy sauce, honey, salt, pepper, and five spice, is relatively simple to prepare. The ingredients can be combined and allowed to simmer on low while the steak is cooking. The result is the spicy tangy perplexity that make each cook desire to continue tinkering with seasonings and amounts instead of always lackadaisically following a recipe. The Spaghetti squash is an incredible impostor for rice noodles when roasted in the oven for about 40 minutes after being split in half with the rind side up. This creates a self induced steaming method that keeps the squash moist each and every time. Whether you are stuck inside during inclement weather or have a surplus of ingredients that seem mundane, think outside the box to create an impostor or imitation meal that will oftentimes strike you or your guests as more delectable and daring than the real thing. Season steak by drizzling olive oil on steak and rubbing spices into meat. Add two tablespoons of olive oil to grill pan and heat on high until oil just begins to smoke. Cook steak for approximately three to five minutes per side or until it reaches desired doneness. Combine ingredients in small saucepan and simmer on low until ingredients are incorporated together and produce desired spicy/tangy combination. More or less garlic chili paste can be added depending on how much heat you prefer. Preheat oven to 400 degrees. Slice spaghetti squash in half and place on oiled baking sheet rind side up. Bake for approximately 30 minutes or until squash feels softened. Scoop seeds out and save. Use a fork to rake the strands of squash out into a bowl and combine soy sauce, oil, and salt and pepper and mix thoroughly. Optional: squash seeds can be roasted in a similar fashion as Pepita or pumpkin seeds in a toaster with olive oil and salt and pepper. They are great in salads or just as a snack. As you may be able to tell from our pictures, we have obviously been cooking a little more than we’ve been writing this week, but I hope you will forgive us. It is my turn to write a post and I’m finishing up Summer quarter, so I’m busy writing papers and unfortunately trying to explain the ontological complexities created by temporality in Paradise Lost and trying to come up with anything to write about The Life of Johnson. I feel guilty about taking a break from writing for school and now I am feeling guilty about using the phrase ontological in a post. I will probably keep the post pretty short to keep from doing it again, I promise. Because one of my favorite things to do when I get stressed is bake even though I am ridiculously pressed for time, I thought I would share some sweet recipes with you finally. Its been rather warm here so I engaged in some form of sorbet spree this week and thought I’d share the results. On Thursday evening I stopped by the store and bought some fresh grapes. I had seen a recipe for a Concord Grape Sorbet on Gourmet’s website and I thought I’d give it a try. For some reason my camera wasn’t really cooperating with me so I don’t have a picture to share with you of the finished product. The best way to describe it was that it tasted like frozen grape jelly, in a good way (unless of course you don’t like jelly). I was somewhat afraid it was going to be a little overbearingly sweet, so I decided to cut back on the sugar and to try and pair it with something salty. So, and this was a tough one to figure out, what goes best with jelly? Peanut Butter! But peanut butter what? Toasted Peanut butter sandwiches? No, too boring. Peanut butter bread? Nope, not enough peanut butter. Ha! I got it! 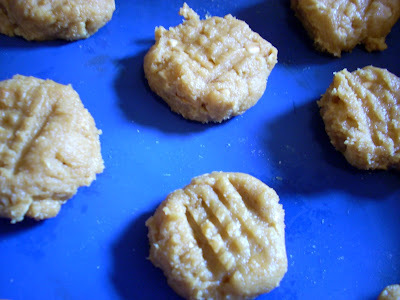 Peanut butter cookies! 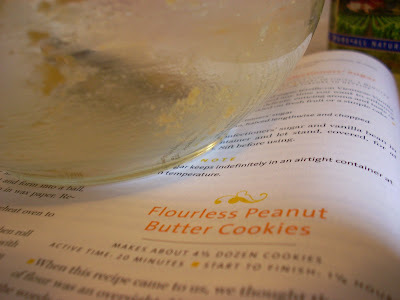 Because I was in a hurry, I decided to make Flourless Peanut Butter cookies. I’ve made them before, with mixed results (everything from too crumbly to too hard and too soft), but this time I decided to try the recipe in my Gourmet cookbook, with some modifications of course. The recipe itself is pretty simple. Peanut butter, sugar, an egg, and some baking soda. Yup. That’s it. That’s all it calls for. Limited beating and baking for about ten minutes. Quick and tasty for my supposedly ‘quick’ break from writing. To try and work out the texture problems I’ve had with the recipe before (and since I was only making half a recipe for Daniel and I), I used just the egg yolk which gave the cookie an almost cake like texture at the end; much more enjoyable then some of the hard crumbly messes that I have had in the past. I also tossed in a handful of oats and an addition of a little bit of vanilla (a teaspoon or so) at the last minute, which helped them to come out with a little more flavor and density. I guess that means they were not technically flourless anymore. Oh well. Although the grape sorbet tasted well, since I have no pictures of it share with you, I’ll also share the banana custard/sorbet I made to take over to my parents for Sunday. The idea behind the sorbet was a cool, refreshing, light, addition to our Sunday meal. Since it was the anniversary of Elvis’ death (whose infamous preference for peanut butter and banana sandwiches made them a staple in my home growing up), I wish I had made the peanut butter cookies to bring over as well, but alas. It was delicious on its own. Daniel and my mom both compared it banana bread, and I was really surprised how creamy a texture the combination of sorbet and custard recipes achieved. It tasted excellent alone, but I could see adding toasted nuts, serving it with hot sauce, or of course, peanut butter cookies! This was supposed to be a relatively short post, but as my theme for the rest of the week is going, oh well. Now if I could only harness that long windedness and finish up my work! First, preheat oven to 350. Then, combine peanut butter and sugar and mix until well combined. Add egg, baking soda, vanilla until well combined. Add oats and mix until well combined. Lastly, roll dough into balls (I do about ½ tablespoon; the receipt calls for teaspoon sized), place on greased cookie sheet,; flatten with fork and bake 8-10 minutes. Cool for two minutes; transfer to rack, cool, and enjoy. First, be sure to choose extremely ripe bananas. These will be naturally sweeter so that the recipe requires less sugar. You may need to increase the sugar to as much as ¾ a cup if the bananas aren’t quite ripe enough yet. Add cold bananas, cinnamon and lemon juice to food processor or blender while you make the custard. For the custard, bring the sugar and water to a simmer in sauce pan over medium heat, just until the sugar dissolves. Next, let the sugar mixture cool for a minute, and meanwhile beat the egg yolks in a small bowl to blend. Gradually whisk the syrup into the yolks. Be careful not to cook the eggs. Return the mixture the same saucepan and stir constantly over low heat until the mixture begins to thicken slightly, 3-4 minutes. Once thickened slightly add custard mix over bananas in food processor or blender and puree until smooth. Chill the mixture in the fridge for at least an hour. Blend again if mixture has thickened, and add to ice cream freezer. Follow the normal instructions for your ice cream mixture, freeze, and enjoy!